Place the sweet potatoes in a greased casserole dish. In a separate bowl, add sugar and melted butter. Add almond extract and vanilla extract to the mix. Once the sweet potatoes have cooled down, peel and discard the skin. 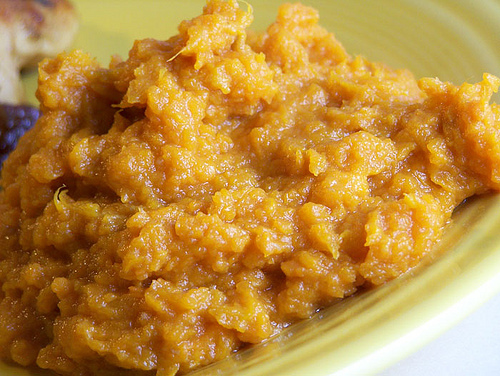 Mash the sweet potatoes in the casserole dish. Drizzle the mixture evenly over the sweet potatoes. Add the nutmeg, ginger, and cinnamon powder. Mix well. Add the casserole dish back in the oven at 350 degrees. Bake for 20 minutes.